Mainland China style Loose granules, single herbs offered in 100 gram bottles. Mix desired amounts of loose single herbs to add to our loose granule formulas or choose specific single herbs to mix together and customize individual formula for specific needs. Scoop the single herbs into warm water, mix and drink. 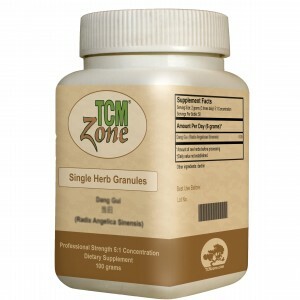 Each bottle contains 100 grams standard granules at 5:1 concentration. Invigorates the blood, transforms stasis, stops pain, cools heat in the blood. * - Bensky: Chinese Herbal Medicine Materia Medica, 3rd ed. Invigorates the blood, promotes the movement of qi, expels wind, stops pain (especially useful for headaches). * - Bensky: Chinese Herbal Medicine Materia Medica, 3rd ed. Tonifies the qi and blood, generates fluids, harmonizes the Spleen, moderates the toxic effects of other herbs. * - Bensky: Chinese Herbal Medicine Materia Medica, 3rd ed. Invigorates the blood, tonifies the blood, calms irritability due to blood heat - Bensky: Chinese Herbal Medicine Materia Medica, 3rd ed. Tonifies the middle burner, augments the Spleen and Lung qi* - Bensky: Chinese Herbal Medicine Materia Medica, 3rd ed. Benefits the Stomach, generates fluids, and directs rebellious qi downward. Nourishes the yin of the Liver and Kidneys, cools heat, stops bleeding, blackens the hair. Cools heat from either excess or deficiency, gently invigorates the blood without injuring the blood or yin, clears lurking fire from the blood. Stops bleeding, removes blood stasis, promotes urination* - Bensky: Chinese Herbal Medicine Materia Medica, 3rd ed. Stops bleeding without causing blood stasis, transforms blood stasis, reduces swelling and stops pain. * - Bensky: Chinese Herbal Medicine Materia Medica, 3rd ed. Reduces food stagnation, especially from meat and greasy foods, invigorates the blood flow, alleviates diarrhea and dysentery. * - Bensky: Chinese Herbal Medicine Materia Medica, 3rd ed. Enriches the yin, cools the blood, clears heat* - Bensky: Chinese Herbal Medicine Materia Medica, 3rd. Acrid, sweet, and very cold, Gypsum Fibrosum (Shi Gao) enters the Lung and Stomach channels. Nourishes the Heart, clears the spirit, unblocks the collaterals, expels wind. * - Bensky: Chinese Herbal Medicine Materia Medica, 3rd ed.